Previously we covered the criminal activities of China in Australia. 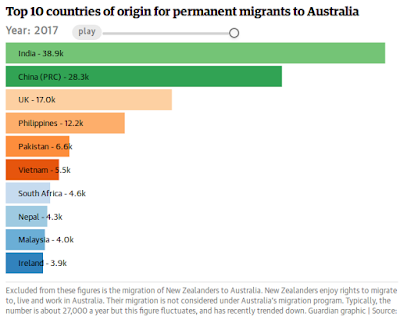 Now we find most of Australia's immigrants are from India and China. How did the two overpopulated behemoths manipulate the hapless Liberals into letting them flood Australia in such huge numbers? October 2018 and acting PM Scott Morrison and immigration minister Alan Tudge are both talking of forcing new arrivals to settle in rural areas for 5 years. This is because 86% of migrants are squashing themselves into cities, mostly Sydney and Melbourne. This plan specifically refers to Tasmania. Tasmanian premier Will Hodgman is 100% locked-on to this policy. Hodgman has been groomed by ruthless Chinese dictator Xi Jinping to implement Chinese policy in Tasmania. Do you think we are joking? Will Hodgman has made many trips to China and has just taken a week off parliament to spend more time in his adopted country. Hodgman wanted to be in China while the Tasmanian health system imploded. Hodgman cannot comprehend China is an unsustainable, hostile, rogue state. Put simply, India and China are reproducing themselves into oblivion and they will take millions of innocent people down with them. "a specialist unit of the People's Liberation Army secretly slipped computer microchips into the servers being manufactured by an American company, SuperMicro Computer Inc Servers are the heart of the internet." The China-Tasmania relationship is total exploitation. They have 1,400 MILLION people, yet tiny Tasmania is forced to destroy our unique ecology just to keep the hordes in toilet paper. Hodgman is also selling China huge chunks of Tasmania, but what will they do when they get here? They will take over. But first they will start fighting the Indians that Morrison will also flood-in to Tasmania. Hodgman and Morrison represent the same imperialist regime that committed an almost complete genocide of Tasmania's original people. Nether has ever apologized for the genocide yet they want to flood Tasmania with Asians from the 2 most over-populated countries on Earth. Why? We all know conservatives have very limited IQ's so we are sure they can't answer that question. Maybe they think that a lot of Indians and Chinese will defend us from a lot of Indians and Chinese? That's how smart Liberals are. We don't want tens of thousands of Asians in Tasmania. We also no longer want half-wit Liberals destroying Australia around us.